I just saw a new linky party called Five for Friday that I thought I'd join in on. My class has been very busy this week. We began reading "Where the Red Fern Grows," started studying Ancient Rome and are trying to finish up the parts of speech. 1. I taped baskets that I got from dollar tree to the wall so that my students could play "grammar ball." This is where I called a student up and gave them a word. 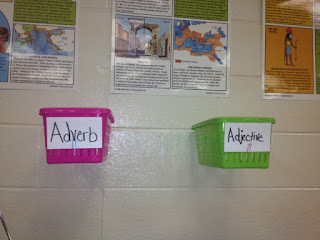 They had to decide if the word was an adjective or adverb and throw the ball in the correct basket. My students are always asking to play now! 2. 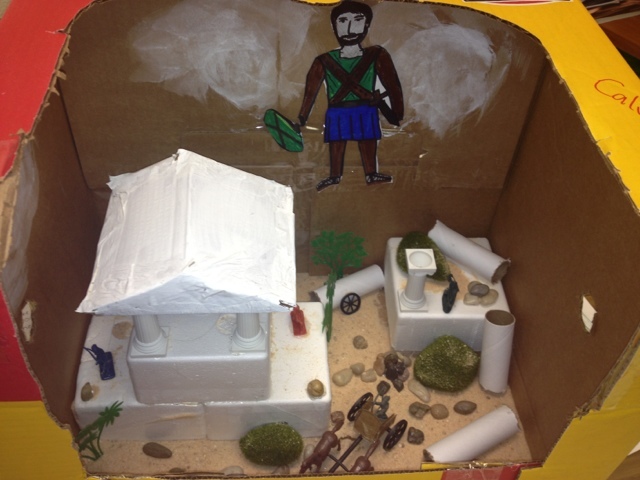 One of my students made this diorama of Ancient Greece for extra credit. We will all miss studying Greece. It has been a class favorite so far. 3. 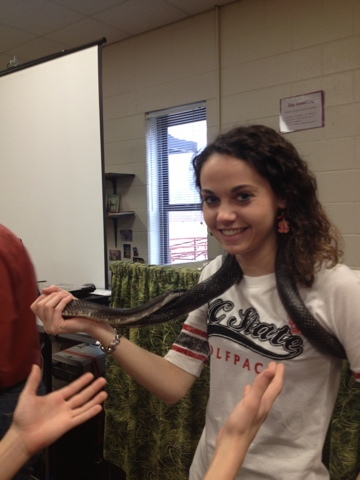 Yes, that is a snake around my neck. We had "snake man" come this week to teach us all about snakes. He helped students learn which snakes are venomous. The students absolutely loved this and I had a great time myself. 4. This is a picture of the notes my students took on the first chapter of "Where the Red Fern Grows." Instead of buying a pre-made unit I decided to just review concepts that go along with each chapter. 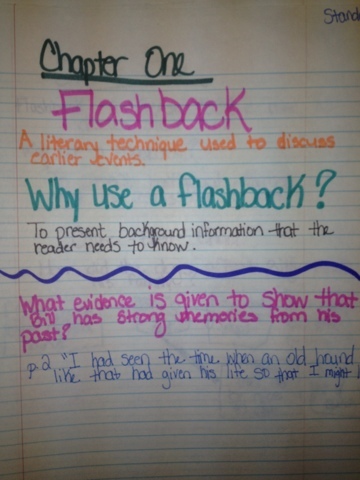 Each chapter I give notes on a big idea and then have the students look for something while they are reading. It has been working great and my students love reading this novel so far. How are things going with your class this time of year? We are studying Greece right now! What are some ofne activities you have done? Iam needing some ideas! I hit hard on Athens and Sparta. We compared and contrasted the two city-states. As an assessment they had to pick a city-state and make up a fictional character that once lived there and tell a story of their life. For the philosophers you could have the students write an obituary for the one of their choice. For comprehension I did cornell notes using Mr. Dowling articles on Greece. I hope you enjoy the unit as much as my class did! We are on to Ancient Rome now. Love the adverb/adjective idea! Lots of my students are in the YMCA basketball league...perfect timing. I loved that book when I was in school! I hopped on over to visit from my friend Kristy's Middle School Blog Log. I am always looking for other grade 6 teachers, even if they are not in the same country! I love the "snake as scarf" picture. Many years ago I attended the Science Teacher's Association of Ontario conference here in Toronto and was lucky enough to have my own "snake scarf". This one was a baby albino python! She was HUGE and heavy and AWESOME. I walked around the exhibit floor with my new friend on my shoulders for over an hour! People are amazed, and scared, but really snakes are amazing animals! Hope you are having a great new year in NC. It MUST be warmer than Ontario!